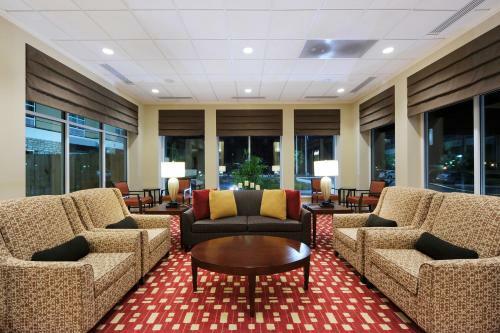 Near the convention center airport and golfing with HDTVs free internet and airport transit the non-smoking Hilton Garden Inn Atlanta Airport North is a convenient spot for our guests. The seven-story Hilton Garden Inn houses 174 rooms featuring plush bedding 37-inch LCD HDTVs and mp3 docks. Microwaves mini-fridges coffeemakers and designer toiletries are also included. Free high-speed internet is available. Dining options include breakfast lunch dinner and room service via the on-site restaurant plus a lounge offering evening cocktails and a 24-hour market. Tranquility overflows in the seasonal outdoor pool and year-round heated indoor pool and hot tub. Early birds and night owls flock to the 24-hour fitness room and business center. Complimentary parking and free 24-hour airport transit are provided. The Hilton Garden Inn is situated off I-85 less than two miles from Hartsfield-Jackson Atlanta International Airport and three miles from the Georgia International Convention Center. Gordon Morris Memorial Golf Course is less than three miles west. Guests head 15 minutes north to the heart of Atlanta to catch a Braves game at Turner Field. Aaron's Amphitheatre at Lakewood is a 10-minute drive from the hotel. discover all that East Point can offer you!